To keep track of the thousands of varieties available today, the American Dahlia Society classifies the flowers according to color, flower size, and form. The largest blooms (classed as AA) can reach 14 inches or more across, while the smallest ones (Pompon and Mignon Single) bear flowers as small as 2 inches across. The shape of the petals (called ray florets) determines the flower formation. 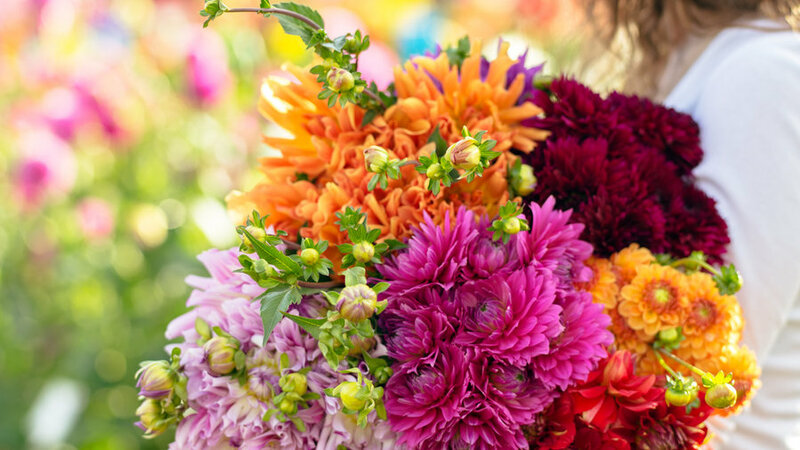 Here we list dahlia flower forms, along with the favorite varieties of three Western dahlia specialists – Erik and Gerda Juul, Jennifer Eubank of Swan Island Dahlias, and Kim Connell of Connell’s Dahlias – and their comments about them. INFORMAL DECORATIVE: Petals are twisted, curled, or wavy, and their arrangement is irregular. ‘Dana’ (bright orange red with a bright yellow center); “very showy in the garden.” ‘Gitts Perfection’ (delicate pink blending to white); “absolutely gorgeous show winner.” ‘San Francisco Sunrise’ (very bright orange); outstanding color, good for cutting. SEMICACTUS: Petals are broad at the base and rolled for up to half their length. ‘Camano Regal’ (purple); “exceptional flower.” ‘Dare Devil’ (bright red); excellent cut flower. ‘Kenora Sunset’ (red and yellow blend); “very popular color,” good for cutting. INCURVED CACTUS: Petals are rolled for more than half their length and curved upward. ‘Bird’s Nest’ (pink); “swirls like a Ferris wheel – very interesting.” ‘Lilac Mist’ (white blending to lavender); excellent in the garden and as a cut flower. BALL: The fully double flowers are ball shaped and more than 3 1/2 inches wide. ‘Jessie G’ (dark red); lots of blooms, great color, good for cutting. ‘Kenora Fireball’ (silvery red); striking color, good form. ‘L’Ancresse’ (white); excellent cut flower. ‘Robin Hood’ (orange and pink blend); unusual color combination. MINIATURE BALL: It is like Ball but smaller, between 2 and 3 1/2 inches wide. ‘Downham Royal’ (dark purple); “beautiful color.” ‘Robann Royal’ (lavender); a popular variety. POMPON: Also similar to Ball, but blooms are less than 2 inches in diameter. ‘Poppet’ (orange); beautiful color, good in the garden. ‘Yellow Baby’ (yellow); a favorite for arranging. PEONY: Open-centered flowers have two or more rows of petals surrounding a disc. ‘Longwood Dainty’ (orange); “a winner.” ‘Powder Gull’ (pink); “a winning flower.” ‘Tasagore’ (dark red); very striking green-black foliage. NOVELTY: This is a dahlia that doesn’t fit in any other class. ‘Alloway Candy’ (pink); a beautiful cut flower.